t*rexes and tiaras: Sunday Shoes 123: Irregular Choice Curtain Call..
With the recent addition of my Mal E Bow heels to my Irregular Choice collection, I seem to have started a bit of a trend for adding pairs which I didn't *think* I loved when they first came out, but then changed my mind when I saw them in the flesh. These are Curtain Call. 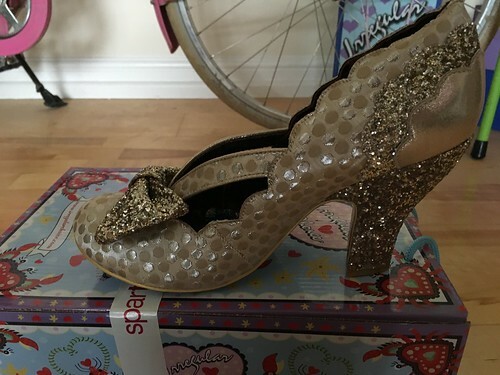 I think they're a relatively new style for Irregular Choice (ignoring the box, which is apparently still current although it's been around for a while now). I know they're currently available in silver and purple colourways over on the main website, so I'm assuming the gold was SS16, but I picked them up from Spartoo. So, the shoes themselves? Well, they're a little lower in the heel than I'd usually wear, and I think that's what has been putting me off them for so long. However, the level of detail on them kind of makes up for this, I think and I'm sure that I'll get used to the slightly lower heel. 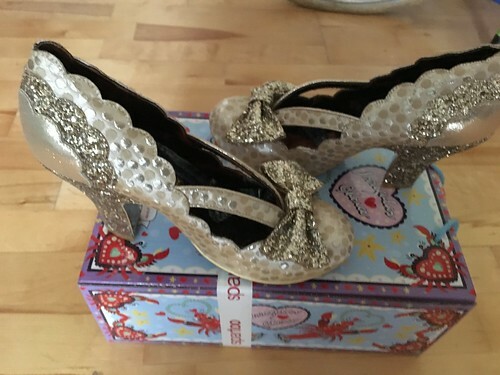 The heels and the bows on the front of the shoes, along with a little scalloped detail at the back, are covered in so much gold glitter; they're fabulous. But I think that one of my favourite parts of all is the double strap across the front of the shoe - similar to Hello Ha - I love the idea of wearing these with a pair of colourful tights, to show off the straps. They are pretty! 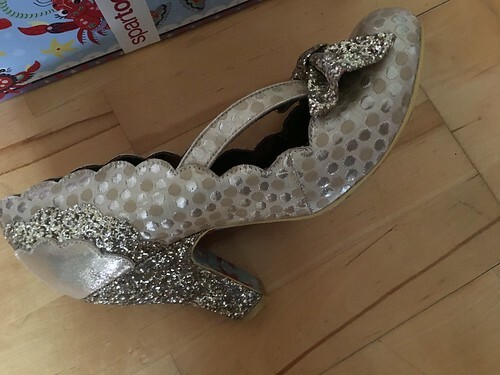 I find it interesting when you say, "Get used to a lower heel," since I see you occasionally wear flats like your unicorn Iced ones or some of your old ICs- is it a mid-heel that causes you a problem or ANYTHING that isn't a court shoe height? Intrigued to know! They don't give me problems. More that I'm not a fan of the look of them (particularly my legs in lower heels).